The festival season comes to an end and Psypien's newest gem of psychedelic propaganda arrives at the right time to brighten up your mood! Developed in his secret underground modular base, Fake News is a collection of special collusions with domestic and foreign agents, as well as solo tracks. Psypien's carries forward his emphasis on original sound design and experimentation, but infuses a brand new and fresh take on his distinct style. Featuring two conceptual solo tracks and three unique collaborations with some of his favorite artists and good friends. Fake News focuses on finding a middle ground between finely crafted detail and spontaneous, groovy and organic energy. 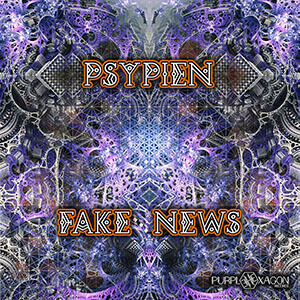 Consuming fake news may be hazardous, but Psypien's psychedelic message of Fake News is a beneficial potion to drink 'til the very end, and over and over again.